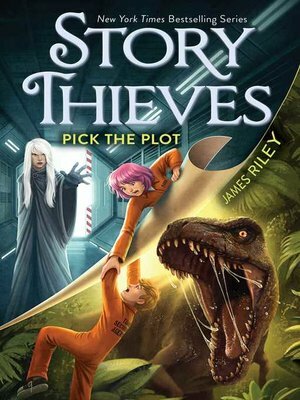 Readers choose what happens when Owen finds himself stuck in a Pick Your Own Plot story, in this fourth book in the New York Times bestselling series, Story Thieves—which was called a "fast-paced, action-packed tale" by School Library Journal—from the author of the Half Upon a Time trilogy. Being able to jump into books used to seem like the greatest thing in the world to Owen Conners. But now Owen's trapped in a time travel book where readers—that would be you—decide how the story goes. As if that weren't enough, Owen's also stuck in a prison for time criminals in a prehistoric era. He's surrounded by bizarre fellow prisoners, including Kara Dox. How does Kara recognize Owen if they've never met before? She seems to think they're old friends, but that can't be possible. Still, Kara might just be the only chance Owen has to escape. And he has to find a way out to save his friend Bethany, who's still in grave danger. Because unless Owen can stop him, Nobody is going to split Bethany into two, separating the fictional and nonfictional worlds forever. Will Owen be able to convince you, the reader, to help him find his way back to Bethany? Or will you feed him to dinosaurs just to teach him a lesson? It's all up to you when you Pick the Plot. James Riley lives in Virginia. He is the author of Half Upon a Time, Twice Upon a Time, and Once Upon the End as well as the Story Thieves series.